SKB PS-55 Stagefive Pedalboard Review – Best Powered Pedalboard Case? SKB is a world recognized leader in producing military grade, indestructible molded cases. So when a company who makes products of this caliber designs a professional pedalboard case to protect, transport, and power your prized collection of guitar pedals, it’s probably a good idea to check it out. 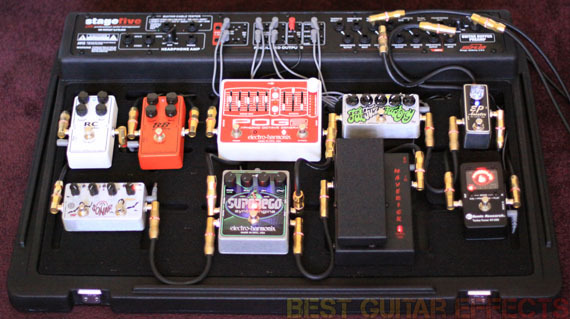 This particular pedalboard is SKB’s flagship product. Is it the best powered pedalboard case out there? Keep reading our SKB PS-55 Stagefive pedalboard review to find out. At a glance this certainly looks like a viable option for anyone seeking a middle to larger size pedalboard. You should be able to comfortably arrange and power 8 to 10 pedals depending on their size and power requirements. 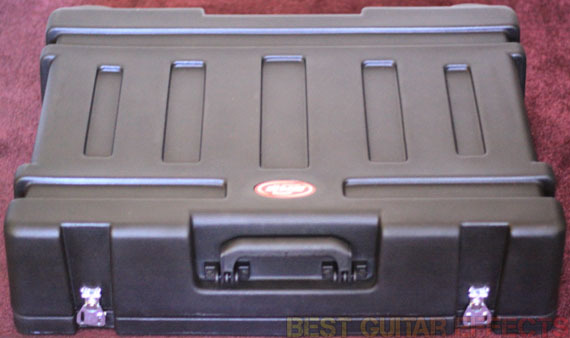 I’ve been using an SKB flight case for one of my guitars for the past 5 years, so I can already personally attest to the quality construction and durability of SKB cases. Now let’s run down the full list of features and get to the real review. 4 standard 9VDC 100mA jacks for Boss, Electro Harmonix, etc. 2 variable DC 100mA jacks for any voltage from 4 V to 12 V.
2 9/12 VDC 100mA jacks for more boutique and vintage pedals. 2 1.3 amp VAC jacks for pedals from Digitech and Line 6. 1 18 VDC jack for MXR EVH Flanger, etc. 1 24 VDC jack for boutique and vintage pedals. All DC jacks have polarity switches. All power outputs are completely isolated, filtered, & regulated. All power outputs include short circuit protection. Headphone amp and buffered preamp. Cable management system for easy cable routing. Angled velcro mounting surface for easier reach. Includes velcro tape for mounting pedals. Capable of “true stereo” setup (route pedals to the front AND effect loops of two different amps). Detachable main power cord with international power supply. Visit SKB for more info about the PS-55 Stagefive Professional Pedalboard Management System. From the moment you pull the SKB PS-55 Stagefive pedalboard out of the box, you’ll notice that this is a solidly built piece of hardware. It certainly has that rugged feel that SKB cases are known for. The SKB PS-55 Stagefive pedalboard gives you a comforting sense of security that your pedals will be very well protected. Like most pedalboard solutions, the SKB PS-55 Stagefive uses velcro to adhere your effects pedals to its surface. While the velcro alone is strong enough to keep most pedals secure during transit, this pedalboard provides an addition layer of security thanks to SKB’s cable management system. The cable management system provides a convenient way to route your cables beneath the surface of the board and also helps to ensure that your pedals stay securely in place. Once you get all of your pedals in place with velcro and route your audio cables below the surface, you won’t have to worry about them coming loose during transport. Thanks to the ingenious cable management system, the SKB PS-55 Stagefive provides more stability and pedal security than any other pedalboard that uses velcro. 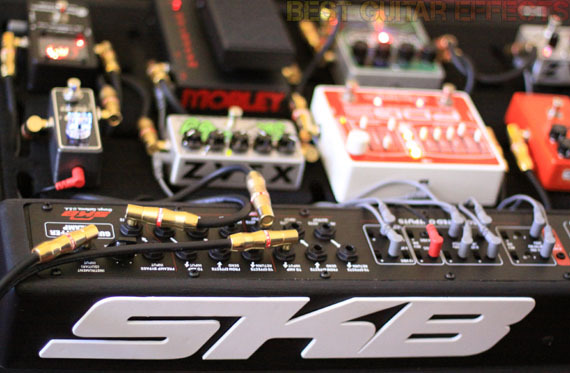 The SKB PS-55 Stagefive comes with a ton of options for powering pedals. (See the features above for details.) And they’ve packed in plenty of power cables. The best part? The power cables are all extra long, so you’ll have no problem getting power to any part of the pedalboard. If you’ve ever used a multi-pedal power supply and kept finding yourself having to rearrange things to compensate for short cables, you’ll be very pleased that SKB have made this a non-issue. And the cable management system lets you tuck away all the excess length. The polarity of all DC jacks can be reversed although for most pedals you’ll probably keep the switches in the negative center position. Two of the jacks even have variable voltage which is really great for that “dying battery” sound. Try it on your favorite overdrive, fuzz, and distortion pedals. The DC jacks all output 100mA which is good for most power needs. Be sure to check the power requirements of your pedals to ensure compatibility. One of the most professional features this pedalboard offers is its true stereo operation. You can run your stereo effects to your amp with dedicated outputs. The SKB PS-55 Stagefive even has two separate effects loops for routing into two different amps. The most creative guitarists might even find some other clever possibilities for all of this generous routing functionality. But the bells and whistles don’t stop there. The SKB PS-55 Stagefive even has a built-in cable tester. You’ll only need to be in a situation to use this once to fully appreciate its inclusion. I have a box of over 40+ cables, and I once misplaced a shorted patch cable in with the rest. Thanks to the SKB PS-55 Stagefive I was finally able to weed out that bad egg from the rest. This particular patch cable revealed its short right before a show. Scrambling to figure out which one was dead right before showtime wasn’t fun. This handy function would have resolved that situation much faster. 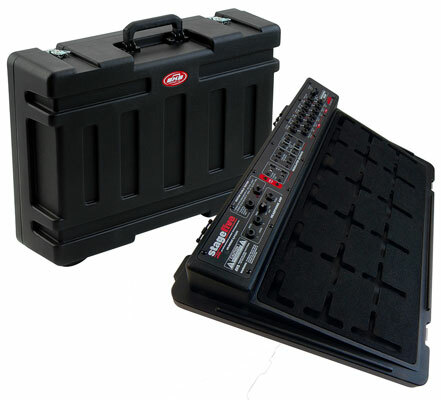 If you’re on tour and need to warm up on the road, the SKB PS-55 Stagefive has you covered. With the built-in headphone amp, you can even use your full range of effects pedals to keep up your guitar chops on the go or in the bedroom. All in all, SKB has a winner on their hands with the PS-55 Stagefive Professional Pedalboard Management System. The SKB PS-55 Stagefive pedalboard is one of the best all-in-one pedalboard solutions out there. If you need the flexibility to power and transport a wide range of pedals, this may be the pedalboard for you. The option for true stereo operation with twin effects loops make this a noteworthy choice for guitarists with stereo pedals. The wide range of powering options, convenient cable management system, and road-tough SKB construction result in a real contender for the best powered pedalboard case out there. The SKB PS-55 Stagefive pedalboard is definitely worth more than just a look. That concludes our SKB PS-55 Stagefive pedalboard review. Thanks for reading. 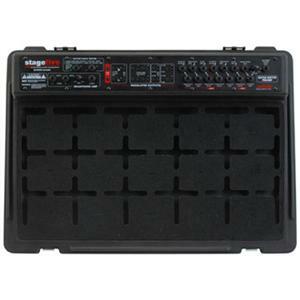 Want to buy the SKB PS-55 Stagefive pedalboard?